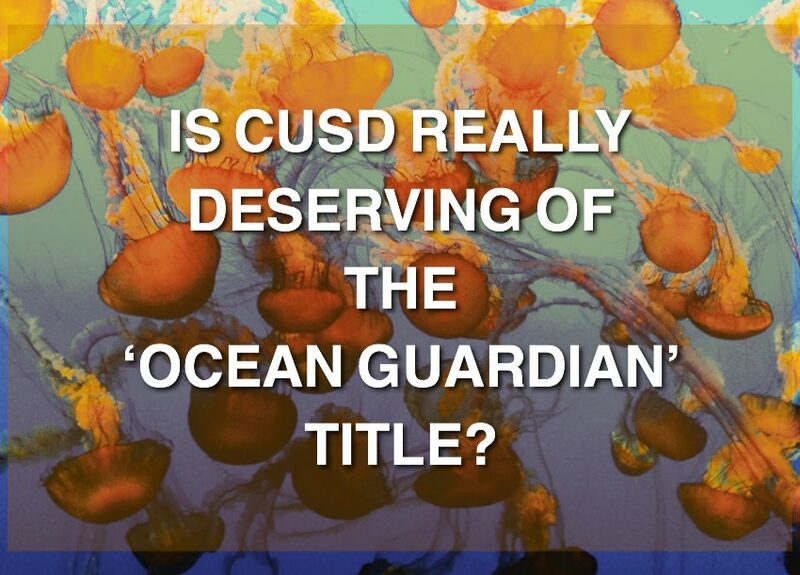 Is CUSD really deserving of the ‘Ocean Guardian’ title? Three years ago, CUSD made history by being the first entire district named an “Ocean Guardian School District.” A long-time steward of Monterey Bay with inventive, fleshed-out programs such as MEarth to help protect and maintain ecosystems, Carmel Unified School District was undoubtedly deserving of such a title. Now I question whether the district is still worthy. Namely, I wonder whether the district is really concerned for the environment or if these actions to help the environment have been taken to make headlines and check boxes. Such an example of this is Carmel High School’s waste disposal system. With a strong Advanced Placement Environmental Science program and organizations such as the Environmental Club on campus, CHS has reason to pride itself on being environmentally minded. The common example in defense of this are the various hubs at which items can be composted, recycled or thrown away. However, last year this system was more-or-less defunct, and that is putting it lightly. The district essentially closed off students’ abilities to compost or recycle by boarding up the waste disposal units. To make that situation sound even worse, the items that were intended to be recycled never reached the recycling plants; according to CHS science teacher Jason Maas-Baldwin, they were thrown away as garbage. Maas-Baldwin also remembers initial plans for a cistern to be installed by the then-new science buildings on the south side of campus. These cisterns were proposed to collect and conserve rainwater so that nearby plants could be watered efficiently. This plan fell through. The turnout was that while it certainly would have been beneficial to the environment and would have conserved CHS water usage, it was simply not efficient enough to warrant such a project. In regard to the title itself, schools apply for the Ocean Guardian School title for the year to the National Marine Sanctuaries sect of the National Oceanic and Atmospheric Administration. In other words, if a school has a particularly eco-friendly year they can apply to NOAA with a reasonable claim to the title. But in recent years CHS has not done anything particularly noteworthy in terms of policy change. Yes, CHS essentially cut out the use of plastic bottles in the cafeteria, thus lowering the amount of plastic that ends up in the ocean, and the school did promote reusable water bottles by installing faucets on select drinking fountains. This was in 2015, the same year that Carmel Unified School District applied for and received the Ocean Guardian School District title. While it is easy to poke holes and criticize CUSD’s environmental efforts, one must also acknowledge the facts in favor of the district’s worthiness. CHS’ efforts may be understated and/or weak at times, but other sites in the district are certainly shining in their environmentally minded aspects. Carmel River Elementary School, for instance, still prominently features beach cleanups with students. Carmel Middle School uses the MEarth facility to teach environmental science to students using real-world examples of ecology right on campus. Even so, there is something to be said about the possibilities for environmental improvement. While our district is relatively green now, there are still ways to become more environmentally friendly. Carmel is constantly shrouded in fog—perhaps solar power should be considered as an alternative energy to offset power usage in CUSD sites such as Tularcitos Elementary School, where the sun is more present in Carmel Valley. Maybe other schools should join in on beach cleanup. Perhaps CHS could even consider reinstating and revamping our compost and recycling efforts. Regardless of how, Carmel Unified School District should be stronger in its efforts to conserve the environment so that the Ocean Guardian title isn’t just a public relations feature.